The De Morgan Centre will be welcoming two established ceramic artists this summer in a selling exhibition. 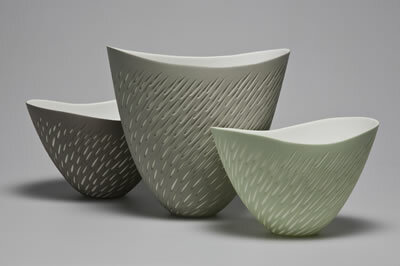 Observed and Made will highlight a variety of ceramic techniques from 5th July – 31st August 2013. Joanna Veevers and Sasha Wardell are ceramic artists with different and distinctive styles that fully complement each other. They have between them many years of experience in studying, creating and exhibiting ceramic art and have experimented with a number of techniques and mediums including mosaic, bone china and slip casting. This exhibition is an exploration of the progression of creativity, from inspiration to completion. Both artists draw inspiration from a variety of sources; Wardell’s bone china pieces are inspired by architectural detail and sections of structure, while landscapes, gardens, stitched textiles, and the concept, order and visual nature of museums all influence the content and arrangement of Veevers’ works. Wardell’s pieces are all individually made using bespoke advanced industrial processes that she has personally developed. The clarity and refined precision of Wardell’s bone china pieces provides a perfect contrast to Veevers’ bold works. Veevers’ works are often site-specific and in this exhibition her works draw inspiration from William De Morgan’s Arts and Crafts ceramics (on permanent display at the De Morgan Centre); the circular mosaics reference the structured designs and richly decorated surfaces of De Morgan’s plates and chargers. A displayed selection of her sketchbooks reveals the creative process, from initial inspiration to finished object. This exhibition provides the opportunity to purchase unique and high quality hand-crafted goods to complement a contemporary lifestyle, at an achievable and affordable price.